Is Willall transmission fluid still good? Or is there something better now? It's been quite a long time since I have been around the GTR forums. I still have and love my GTR but life has taken me in other directions that take ALL my time up for the past 2 years. But I remember all the GTRLife and GTRHeritage split fallout and thought to myself if I want good answers this is the place to come =). In all that time I was an early adopter of the willall (middle spec) transmission fluid and their diff fluid. I always had good results with it (did a couple of UOA) and the car drives fine. But now a days I don't get out to the track except maybe once a year and with my own imposed change interval (2 years) approaching I am wondering if I should stick with the Willall or is there something better now? Talking with Eric @ Boulder Nissan he likes Dodson and from my limited (time) research here it seems that there are lots of good fluids and it's mostly a price point issue at this time. The main reason I am trying to explore options is I honestly just don't track the car as much so do I really need the heavier weight fluids? And when I did I was only seeing about 245F max temps. On the other hand I am 5 years with the willall fluids and around 35k miles with no issues [knock on wood] so if it's not broken should I fix it? I don't really care about the price of the fluids much as I would rather buy a more durable fluid with a longer OCI to save time and money in the long run. But my only concern at this point is am I doing any undue damage only driving the car spiritidly on the street where my max trans temps are only in the 185-190F range (I run the Greddy DCT). I am wondering if it might not be better for the transmission to run a OEM ATF like fluid since I am mostly street use now? Basically is there any harm or something much better to run than the willall stuff in this day and age? Edited by davidm_sh, 04 November 2014 - 05:11 PM. There is very likely very little risk of running the WillAll - except to your pocketbook. The WillAll is a GL5 fluid, while the Dodson is a GL4+ fluid, GL4+ likely being a little better for synchronizers, while the GL5 being better for gears. The past, standard fluids, WillAll was the thicker fluid, and the Dodson was thinner. Honestly, cost no issue, I'd run the Dodson. No questions asked. The best of the best note that it protects the gears very very well. If I didn't track the car much, I had a transmission cooler, and I had no horsepower upgrades? OEM fluid should be fine. If I was looking for the cheapest fluid that should do great? The Motul DCTF should do. If I was willing to go "out of spec" and use the BEST fluid that was the CHEAPEST? Amsoil transmission fluid. For differential fluid? Price point? Motul 75W-140. The Nismo is great, but it's just a slightly different oil than the standard Motul fluid, and terribly expensive. The WillAll is RIDICULOUSLY priced. While the "solid boundary additive" is interesting, is it worth what they are asking? Very unlikely. Also, the OTHER manufacturer on the PLANET that uses a "solid" additive is Redline, and they recommend avoiding coolers with those additives, due to potential clogging. Honestly, there is no fluid that you have listed that is unacceptable. All will work just fine, and hold up well. Most of the advantages of one vs. the other are cancelled out by some other potential downside. On the dyno I tuned on a stock GTR (2009-2010 era) would baseline around 435whp. I baselined with the above mods at 475whp. So I had my tuner tune me an E85 map that would only run about 10psi that would hit that hp goal (for track days). And then I have a 'fun street/strip' E85 tune that kicks up around 535 whp/555 wtq. So I would estimate that I am around 600hp at the crank so more power but nothing compared to what a lot of guys run these days. With your input I guess I am leaning towards the Dodson. Aren't there different grades? I thought I saw a post around here with viscosity report on 3 different varieties? There used to be two temp varieties, but no one who tracked used the low temp kind. That being said, they basically should be viewed like the old fluids. Higher version is better for hot extended temps; but needs to be warm for best performance. There is also the r35tfp. there was a plus or minus 30c in this version but they did away with the lightest. We have good prices on the R35TFP shipped. If interested I can send you a quote. I think that formula differs very little from the DMS TFP sport, but that's just from the analyses that I know of. Since that one is no longer on the website, is that what Dodson is still making available only to vendors at this time? Or is it phased out? I cannot tell. They are completely different. The DMS TFP Sport is a very thick fluid. The R35TFP is the US market fluid that is easily available. gotcha. The chemical signatures look similar, I had not seen the viscosity. Wonder why R35TFP isn't on the website anymore? And, do you have access to a spec sheet of DMS TFP sport? I do not, and would like to see the cST. Yep, those are the old fluids I was used to. I have a container of the +30 fluid myself. And what shep is referring to is now just the old +30 formulation of the regular fluid. Can't prove it though, I have only seen the additive analysis from out of the usa and not the full shebang. Suspect that shep knows, but all of their fluids are very solid and reliable. I know it's not the best to resurrect REALLY old threads but this seemed like the best thing to do in this case . I am back/still around. Still owning and enjoying my GTR but I don't keep on the forums like I used to. I now have 18,000 miles on my last fill of Dodson +30 formulation (11-12 cST @ 100C) fluid and it's been just fine - it's treated me well. But it seems that the fluid landscape has changed quite a bit in the past 3-4 years again which isn't a bad thing but I am having a hard time finding the closest substitute for the Dodson I currently have in the transmission. I have emailed dodson but they seem extra cagey on giving me the viscosity specs to compare against. I also have phone calls out to Shep and Jack's Transmission shops waiting to hear back. 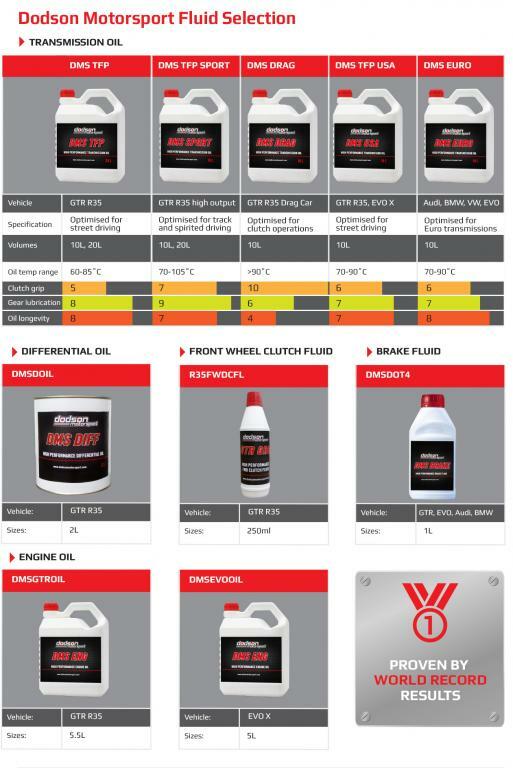 From my little research it sounds like quite a few people are using the Motul stuff but I don't like the idea of that thin of fluid especially since I have had good luck with the thicker stuff (referring back to this thread I was an early adopter of Willall and then Dodson). I don't care about price given my very infrequent changes due to keeping mileage (and sadly these days) not many track days to a minimum. So I am putting this out to the experts (shawnhayes or descartesfool still around ? ) on this forum for advice. To reiterate I want something that is thicker / road race / high temp oriented than OEM (like the current/old Dodson product I am running). I’ve been running the Amsoil ATF for about 4 years now and over 20k track miles. Changed it 3 times so far and haven’t had any trans issues. I do have a cooler and my trans temps are kept under 250F at the track. Dodson and Pentosin FFL Racing are the best bets other than OEM here. The amsoil products are solid as well. But they should be viewed in the same viscosity class as Motul. The Motul is good for stock power, but heavy duty/high power/no cooler, maybe not. When people say "Dodson" which one? My car is about 95% (aggressively) road driven with maybe 1 track day / year these days. I do have a Greddy trans cooler and temps get into the 240-250F range on track days. Does anyone have any knowledge about which Dodson TFP product is closest to 10-12 cST @ 100C viscosity? TFP USA is their part number for the USA distributed fluid. For street and mild to moderate track that is what we recommend and keep a heavy stock of at all times. It also is the oldest formulation that they have, so based on your thread date the fluid you have been running. It has a higher temperature range than their standard TFP part number. They offer this chart if you are unfamiliar with it as well.